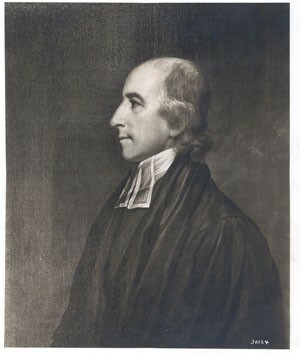 On December 31, 1801, The Right Reverend Benjamin Moore, rector of Trinity Church and bishop of New York, as well as previously president pro tempore (1775-1776) of King's College, was elected Columbia College's fifth president. In the days preceding Bishop Moore's election as President, the Trustees had passed a resolution that henceforth the President should be relieved of the professorships which had previously been attached to this office, making Moore the first full-timed administrator of Columbia College. During Moore's administration the whole curriculum was revised, admission requirements tightened and the faculty enlarged. Fees formerly paid to professors by students were abolished and each student was required to pay $100 to the College treasury. In this period, too, the Charter was re-examined, revised and reissued in 1810. The student societies, Philolexian (1801) and Peithologian (1806), came into being. Due to the pressure of his diocesan and parochial duties, Moore's involvement in Columbia College was minimal, with his public appearances confined to commencement and other particular occasions. Due to his declining health Moore resigned on May 6, 1811. Click here for information on Benjamin Moore's first term.